Dusty was found on the streets of Houston and is a happy social boy who gets along with other pups and people. He is very gentle, loves to cuddle and to play and enjoys being brushed and bathed. A very good little guy. Dusty is 9.4 lbs and about 1.5yr old, Shih Tzu Havanese mix with the cutest underbite. If you think Dusty would be a good fit for you and your household, please fill out an adoption application today! 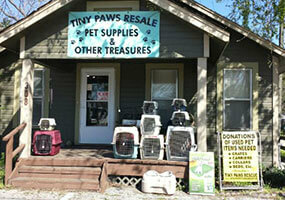 Tiny Paws and Chi Rescue is a non-profit, all volunteer dog rescue organization near Spring, Tomball and Houston, TX. Find the perfect Poodle, Chihuahua or other small breed dog on our Adoptable Dogs page then filling out a Dog Adoption Application!